You may check the original link here. 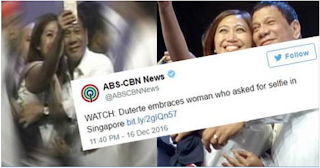 Roma Neriz, is the Singapore-based Pinay OFW identified as a solid Duterte supporter from Nueva Ecija who made instant celebrity over night after her selfie with Duterte was given a malicious spin by ABS-CBN. According to Mai Laborde, a Senate and Malacanang speechwriter, Roma Neriz expressed the desire to clear Duterte’s name after ABS-CBN’s heading made it appear that the President was taking advantage of her desire to have a selfie with him. When the Pinay OFW reads the ABS-CBN news report about her encounter with the President that was given a shady treatment, she did not hesitate to post the real story behind the “selfie” incident to clear Duterte’s name. GRASYA SA DISGRASYA” Libo libong pilipino pinag isa ng ating mahal na Pangulo. Shake hands lang naman sa Pangulo ang pangarap ko kasi sabi ko malabo ang selfie dahil nasa stage sya! Hanggang sa naka kamay nako, paalis nako sa crowd natulak ako, that time hindi kinaya ng tibay ng high heels ko ang pag kakatayo ko at hindi na ako maka alis. Nakita ako ni President at mga PSG. Wala talagang way out but to pull me up to the stage! Salamat mahal Na Pangulo, I’m still alive dahil sayo at sa PSG napabuhat pa kayo sorry nabigatan kayo. Screenshot of the conversation between the Pinay OFW, Roma Neriz with the Malacanang speechwriter Mai Laborde. Netizens who read her post reacted harshly against the giant news media network, condemning their unethical journalistic practice. Teddy Alvaro wrote: Pinalalabas nanaman nilangbbastos ang Presidente! Haissst! 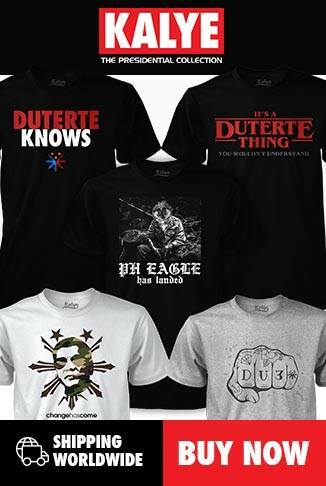 Dapat siguro wag na i renew ang franchise ng mga bias media. If you have a message to ABS-CBN, you may post your message by commenting below.